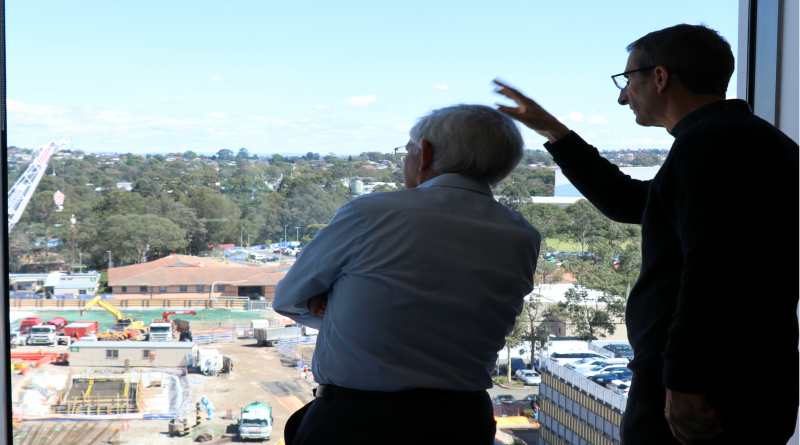 Dean of Science at the University of Sydney Professor Trevor Hambley and co-director of the Centre for Cancer Research at The Westmead Institute for Medical Research Professor Graham Mann survey the construction site of the new hospital building and forecourt plaza. The Dean of Science at the University of Sydney, Professor Trevor Hambley, visited the Westmead precinct last Tuesday. Prof Hambley, who was was accompanied by the vice-chancellor’s representative at Westmead Professor Chris Peck and the director of academic strategy Professor David Cook, met a selection of leading research scientists from across the precinct and learned more about their work. The dean also delivered the opening remarks at a session with local high school students, who met met honours students, to hear about their research projects. In tandem with the dean’s visit, the senior management team for the Faculty of Science also visited Westmead, taking a tour of the new education facilities in the Westmead Education and Conference Centre. The facilities were recently built collaboratively by the University, WSLHD and SCHN as part of the Westmead Redevelopment. Their visit also included an orientation tour across the breadth of the precinct.